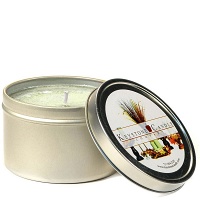 These 4 oz candle tins are perfect to take with your when you travel. If you stay in cheap hotels or motels, these small candle tins can help freshen up your room even without lighting them. Just take the lid off these highly scented candle tins and place it on the night stand. You will notice fresher air in your room almost immediately. If you do pack these scented candles to travel be sure to put them into a zip-lock bag to keep any fragrance or wax from leaking. When you do light these small candles they will burn for approximately 20 to 25 hours. We offer our travel tins in a wide assortment of fragrances to chose from so are sure to see one you like. 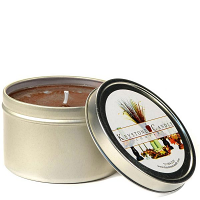 These small tin candles are also great to use a wedding favors, bridal and baby shower favors, or small gifts. If you want personalized candle tins we can do that for you too.